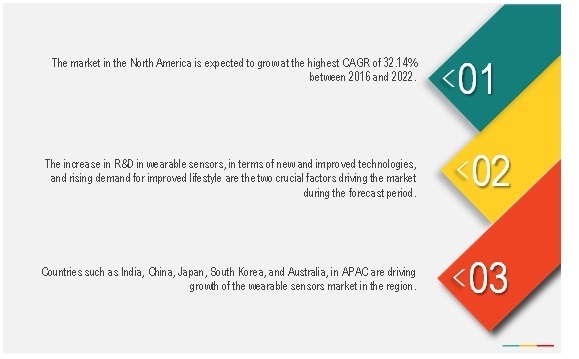 [208 Pages Report] The wearable sensors market is expected to grow from USD 189.4 million in 2015 to USD 1,654.0 million by 2022, at a CAGR of 30.14% between 2016 and 2022. Wearable technology indicates devices with components such as sensor, battery, connectivity, interface, and other material and algorithm. They are worn either on the body (on the neck, eye, ear, hand, wrist, and foot) or inside clothing. Wearable devices simplify human–computer interaction through a small computer worn on the body. The key devices in this category are activity trackers, smart clothing, smart glasses, smartwatches, augmented reality (AR) devices, wearable cameras, and gaming devices. In addition, they offer a wide range of services such as hands-free operation, real-time data monitoring, network communication, and logic calculations. Sensors are the most important component in wearable technology; they help generate information about the physical event or state. Sensors can measure everything from the surroundings including orientation, motion, light, sound, humidity, temperature, and biometrics such as blood pressure and heart rate. Additionally, continued innovation in sensor technologies is expected to expand the wearable technology capabilities even more. Thus, the need for sensors in wearable devices is one of the major factors supporting growth of the wearable technology ecosystem. Led by rising demand for smart platforms such as IoT and M2M, the demand for sensors that are small, low prices, and incorporate smart technology is increasing. With such platforms and increasing inventions in smart mobile devices such as smartphones and tables, there has been a decline in the cost of sensors, and the introduction of new simple, easy-to-use next-generation sensors has increased. Moreover, led by significant developments in technology, since the past decade, the size of sensors such as level, pressure, and image sensors has decreased appreciably; this is one of the major factors behind overall market growth. For the past four to five years, the use of smaller sensors that can be embedded in smartphones and wearables has grown rapidly. For instance, the size of the pressure sensor has been reduced from 0.5ìm to 1mm. This, coupled with use of MEMS technology has expanded the number of applications for sensors in the field of wearables related to healthcare and consumer goods. 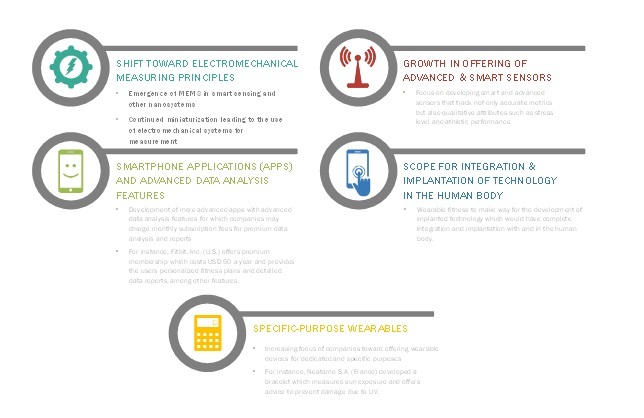 MEMS sensors are small devices that combine digital electronics and mechanical components in one platform; thus, they have strong potential to drive the demand for wearable sensors. The miniaturization of sensors using microelectronics has been instrumental in the development of wearable devices. One of the major hurdles in the adoption of sensing technology, especially for wearable electronics, is the size of the sensors. The hardware components gather the physiological and movement data which is suitable for long-term monitoring applications. Companies such as STMicroelectronics, NXP Semiconductors, and Broadcom are the major players investing heavily in R&D. The increasing use of sensors based on MEMS, nanoelectromechanical system (NEMS), and CMOS technologies is also another key market driver. The research methodology used to estimate and forecast the wearable sensors market begins with capturing data on key vendor revenues through secondary research. Some of the secondary sources include associations such as Center for Advanced Sensor Technologies, International Frequency Sensor Association (IFSA), Semiconductor Equipment and Materials International (SEMI), and IoT ONE Community. The vendor offerings have also been taken into consideration to determine the market segmentation. The bottom-up procedure has been employed to arrive at the size of the global wearable sensors market from the revenue of the key players in the market. After arriving at the overall market size, the total market has been split into several segments and subsegments which have been verified through primary research by conducting extensive interviews with key experts such as CEOs, VPs, and directors. The data triangulation and market breakdown procedures have been employed to complete the overall market engineering process and arrive at the exact statistics for all segments and subsegments. The breakdown of the profiles of primary respondents is depicted in the below figure. *Others include sales, marketing, and production managers. The wearable sensors ecosystem includes raw material suppliers, chip designers, and technology providers such as NXP Semiconductors N.V. (Netherlands), STMicroelectronics N.V. (Switzerland), TE Connectivity Ltd. (U.S.), Broadcom Limited (U.S.), Knowles Electronics, LLC. (U.S.), Analog Devices, Inc. (U.S.), Infineon Technologies AG (Germany), Asahi Kasei Corporation (Japan), Sensirion AG (Switzerland), InvenSense, Inc. (U.S.), Robert Bosch GmbH (Germany), Texas Instruments Incorporated (U.S.), Panasonic Corporation (Japan), mCube, Inc. (U.S.), ams AG (Austria), and ARM Holdings Plc. (U.K). In October 2016, STMicroelectronics and HMicro, Inc. (U.S.) launched ‘HC1100’, a single-chip solution for clinical-grade, single-use disposable smart patches and biosensors that can replace wires used in medical sector for vital-sign monitors and electrocardiograms. In May 2016, Analog Devices, Inc. collaborated with Microsoft (U.S.) and Hexoskin (Canada) for offering unique sensor-equipped vests worn, which provides IoT solutions for athlete and team performance management. This allows coaches and team staff to monitor players’ performance details such as motion, heart rate, and other useful health and performance metrics of players. It also helps in overall better management of players’ health. In May 2016, ARM acquired Apical Ltd. (U.K.) for USD 350 million. Apical's technology would complement the ARM Mali Graphics, display, and video processor roadmap with products such as spirit, assertive display, and assertive camera. Most of the suppliers have opted product launch and development and collaborations & agreements as the key strategies as could be seen from the recent developments. Where will it take the industry in the mid to long term? Which are the emerging key players in the market and how intense is the competition? The wearable ecosystem witness concern of security and privacy, when will this scenario ease out? Market size for 2017, 2019, and 2021 for segments such as type, application, vertical, and geography. 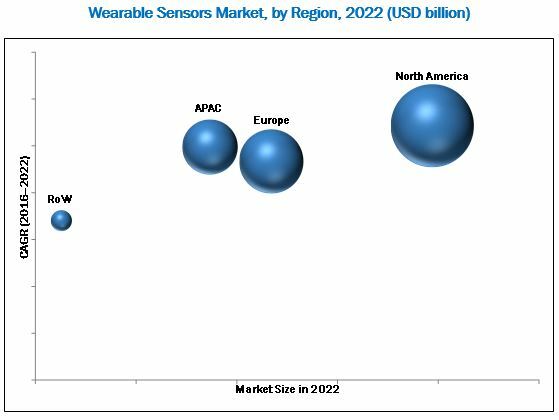 According to MarketsandMarkets’ forecast, the overall wearable sensors market was valued at USD 189.4 million in 2015 and is expected to reach USD 1,654.0 million by 2022, growing at a CAGR of 30.14% between 2016 and 2022. The growth of this market is propelled by the increasing advancement toward smaller, smarter, and cheaper sensors, miniaturization trend in sensors, rising share of aging population, and mounting benefits of wearable devices in the healthcare sector. The market is further driven by advent of platforms such as IoT, AR, and M2M, growing interest of Tier I players in wearable ecosystem, and growing trend toward smart living among end users. This report covers the wearable sensors market based on type, application, vertical, and geography. In terms of type, pressure and force sensors are expected to hold a major market size during the forecast period. The growing usage of wearable devices such as smart watches and fitness bands is likely to drive the market for pressure and force sensors. These devices have created awareness among people to be fit and healthy by continuous monitoring of their health. Thus, pressure and force sensors are widely used in many sectors such as consumer electronics, medical, and healthcare for a variety of applications such as smart shoes and smart socks. The market for the bodywear application is expected to grow at the highest rate between 2016 and 2022. Rapid changes in terms of manufacturing technology, innovation, and technical advancements in various industries are expected to drive the market for the bodywear application. The significant growth of the bodywear segment can be attributed to the growing popularity among the youth and the increasing need for continuous health monitoring and safety in sports and industrial sectors. The market for the consumer goods vertical is expected to grow at the highest rate between 2016 and 2022. Applications such as fitness and sports, infotainment and multimedia, and garments and fashion are majorly considered under the consumer goods vertical. The increasing demand for smart gadgets and gaming devices for interactive gaming and entertainment in the consumer goods sector is driving the growth of the wearable sensors market for the consumer goods vertical. Applications such as fitness and sports, entertainment and multimedia, multi-function, and garments and fashion come within the purview of the consumer vertical. Demand for wearable sensors in the consumer goods vertical is being propelled by miniaturization of sensor technology and increase in consumer demand, coupled with proliferation and enhanced communication protocol. Smart wristwatches that record heart rates and intelligent bands that track physical activities are some of the major devices used in fitness- and sports-related applications. One of the two key factors driving growth of the wearable sensors market in fitness and sports is increased awareness about health, fitness, and wellness. The garments and fashion sector is expected to consolidate further with the introduction of electronic-textiles in the coming years. The scope of this healthcare vertical includes continuous glucose monitoring, ECG monitoring, pulse oximetry, blood pressure monitoring, and skin patches. Skin patches are small adhesive devices incorporated with various medical sensors and attached to a patient’s body to measure body metrics such as heart rate, respiratory rate, and blood pressure. Such sensors in wearable devices act as extensions of smartphone devices—they gather data and transmit information wirelessly. Wearable devices used in the industrial vertical include image scanners and compact, mobile, and wireless computing systems that can be worn on the body. Bodywear, eyewear, and headwear integrated with sensors can be used for a variety of industrial purposes. For operational efficiency in industrial operations, wearable devices integrated with highly accurate and sensitive sensors are used, which include smart textiles tailor-made for industrial purposes. ‘Zypad WL1500’ is a wearable computer that enables users to access instant computing capabilities. How wearable will change the fitness industry? Which vertical will hold the major market potential in wearable ecosystem? Will the wearable sensor suppliers continue to explore new avenues for wearables? The steady increase in the number of connected devices and potential applications of wearable technology offer opportunities for market growth. On the flip side, lack of common standards and interoperability issues, high cost of wearable products, regulatory issues, and concerns regarding security and privacy growth inhibitors. Some of the major challenges for the market are technical difficulties related to hardware and software, device protection and thermal considerations, and increased integration among the electronic components. The major challenges for the companies in the market are technical difficulties related to hardware and software and increased integration. Companies have adopted the new product developments and partnerships, contracts, agreements, & joint-venture strategies, to expand their market presence and distribution networks in the wearable sensors market for the forecast period. The major vendors in the wearable sensors market include NXP Semiconductors N.V. (Netherlands), STMicroelectronics N.V. (Switzerland), TE Connectivity Ltd. (U.S.), Broadcom Limited (U.S.), Knowles Electronics, LLC. (U.S.), Analog Devices, Inc. (U.S.), Infineon Technologies AG (Germany), Asahi Kasei Corporation (Japan), Sensirion AG (Switzerland), InvenSense, Inc. (U.S.), Robert Bosch GmbH (Germany), Texas Instruments Incorporated (U.S.), Panasonic Corporation (Japan), mCube, Inc. (U.S.), ams AG (Austria), and ARM Holdings Plc. (U.K).